The Sports Promenade at the Singapore Sports Hub, is an extension of the Park Connectors that Singaporeans have come to enjoy. 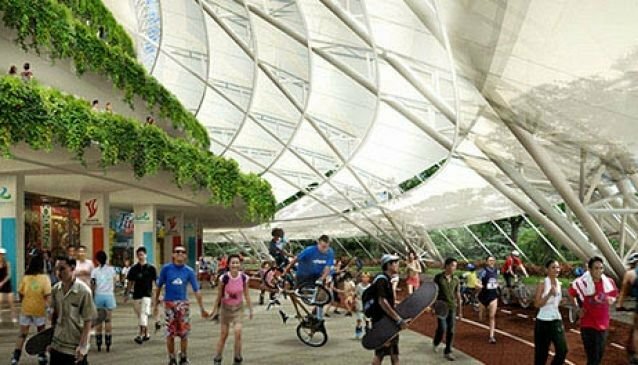 Featuring a 900 square metre sports and recreational space around the National Stadium, this will be Singapore's largest fully-sheltered civic space, which will be open to the public 24 hours a day, 7 days a week, the whole year-round. The Sports Promenade, which will attract Tai Chi, Yoga or even Zumba enthusiasts, can be used as a large outdoor space venue which ensures a rain-or-shine event. It's elevated platform provides views of the city and will act as a central connector to link the the major facilities and community areas of Singapore Sports Hub. Opening scheduled in June 2014.